Recently I took the opportunity to get a hands on look at the new Hoyt HPX Riser and Hoyt's top of the line F7 limbs. in this post I will talk you through what I thought of them both and how they felt to shoot. The first thing I noticed when handling the HPX riser was its more de-flexed design, this design was first implemented in early compound design. The throat of the grip is actually in line with the back of the limb pocket. The next thing was the placement of the holes. With the old RX handle I was always put off by the section between the grip and the lower pocket, this section always seemed a bit on the thin size, structurally speaking it was sound but it was somewhat off-putting. This section has been seen to and personally I'm satisfied. One new feature for Hoyt that I expect and hope to see more of is the layer of Teflon fixed to the underside of the limb bolt, this allows you to make changes to the bolt when the bow is strung without making major damage to the limbs. Another benefit of the layer is that it improves sound dampening and a small reduction to vibration levels. The riser has been garnished with carbon fibre inlays in small sections such as the back of the Formula limb pocket and for some reason the top of the limb bolt. The Hoyt F7 limbs have been described as an 'engineering marvel' and 'an amazement of science', honestly speaking I think they went a bit far. Yes, they are smooth to draw (the smoothest I've encountered so far) and they do feature some new scientific innovations, but an amazement of science is a stretch. The F7 limbs felt very smooth to draw, draw force graph would be steady until half way then level out. The F7 limbs only start to stack apparently when you start hitting 29" on a 68" bow. 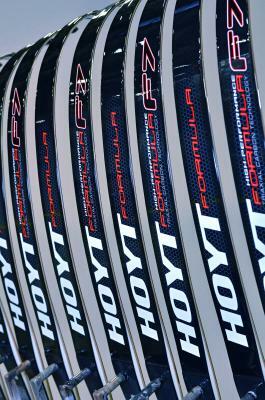 This is mainly down to its "Triaxial" Carbon Technology, simply put, it means that Hoyt have layered their carbon weave in three directions. This layering effect produces a stronger, more controllable, more consistent performing limb that is effected less by its environmental temperature. 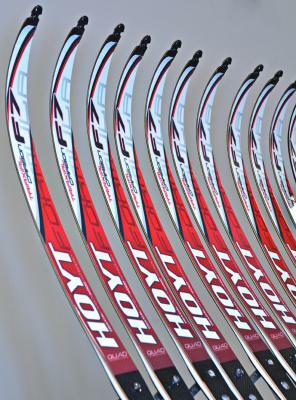 The limb graphics remind me of the red 900CX's (When Hoyt started looking at aesthetics as a selling point). Using the red and black theme to evoke excitement and danger, the long sweeping lines feeding back into the curves of the bow. 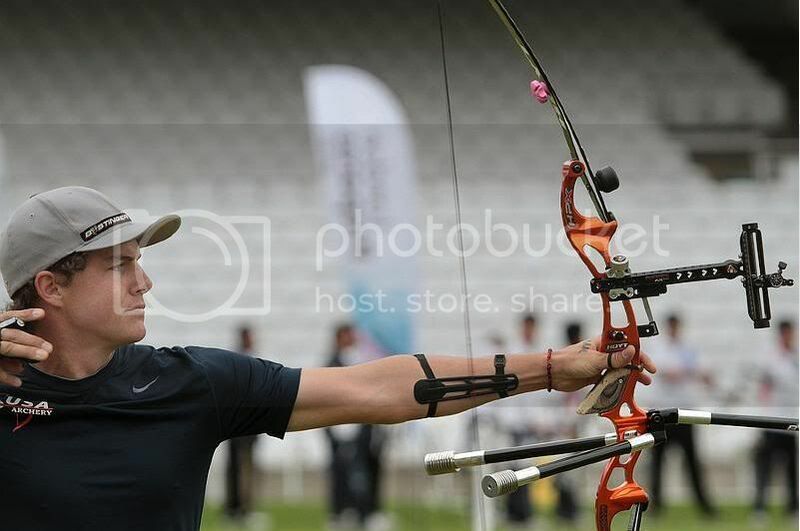 Having the opportunity to shoot a pre-launch bow was a great privilege and a honour. Although not at the time, I didn't want to make the bow look bad or slam an arrow into the wall. Honestly i was worried more about that than having a good feel for the bow. From what I could feel, the bow was very prone to torque, this is most likely due to the de-flexed riser design previously discussed. The tiniest movement in the hand and you could see the longrod swaying from side to side. This made it hard to 'settle into the shot' producing some wayward shots. The grip felt comfortable (same grip as the RX). The weight of the riser isn't amazing (1224g 25" 1270g 27") but it has been distributed in a way that the riser feels bottom heavy. The limbs felt smooth and sturdy, but more importantly fast, the stats say that they are just over 2fps faster than any other limb currently available. The manufacturers say that they will be producing a synthetic foam core (which i tested) and a Maple core option. Pre-order prices range from Â£500-540 for the riser and limb prices have not yet been set. Please feel free to ask any questions, i will do my best to answer asap.